I set a goal of completing 12 specific UFO’s in 2007 and listed them on my sidebar so they were public. I completed 7 of those 12 projects that were listed. This has proven not to be the best way for me to work through my UFO list. I like to work on a specific project when the mood moves me. Listing specific projects just adds to my feelings of guilt and seems to further hamper progress so I won’t be listing specific projects for my goals for 2008. However, of the 7 specific projects that were listed by name in 2007, five were gifted to others which is an achievement that I will celebrate. One of those projects was particularly old and was a challenge for me on the most extreme scale–this was the South American Challenge which was a quilt developed from non-traditional quilting fabrics that had significant meaning to my niece and formed part of her wedding gift when she was married this year. In addition to the quilts I targeted for completion, I also finished 14 other projects in 2007. Five of these projects were also gifted to others. This brings my total for the year to 21 completed projects of which 10 were gifted to others. I have been working towards reducing my total number of UFOs for some time now. I managed to add only 3 projects to my UFO pile in 2007 and finished a further 12 projects to the flimsy stage. I am definitely moving in the right direction and seem to have taken control of my UFOs for the first time in years. This I am very pleased about! 1. To continue to have fun with my quilting! I quilt to explore and express my creative side and quilting must remain fun for me or else it is just another job. 2. To continue working towards eliminating my UFOs, even if they are just moving to the flimsy stage. 4. 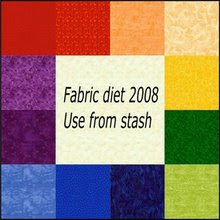 And finally, a commitment that many on this blog ring are making, use from my stash first! Of course, my stash may require “enhancement” from time to time to keep the stash in an overall usable state! Thanks to Hanne for creating this button to remind me of this commitment. My goals for March were to finish my March bluework snowman block and to quilt and bind my Bricks and Stepping Stones Quilt. The March bluework snowman block was finished about a week ago. ….but the Bricks and Stepping Stones quilt was not finished until late last night–just in time to make the March deadline! This quilt will be given to one of my niece’s as a wedding gift when she gets married on April 14. This quilt measures 86″ x 104″. I have quilted this quilt in the Wave design using Superior’s So Fine thread. This is a thread developed by John Flynn and it is the best performing thread I have come across for my long arm. I pushed the speed of the quilting on this quilt and the thread took a beating. This thread never broke once and never gave me an ounce of tension trouble. I like all of Superior’s threads, but So Fine will be the future workhorse of my studio, I am sure. This is a closeup of the fabric on the border of this quilt. I love this fabric. I also finished my crayon block. The moles seem to have eaten my daffodil bulbs so the only daffodils I am going to see are those that I put on a quilt! This last picture is Joey. When I am finished with the binding on a quilt, I like to measure the length and width of the quilt. The tape measure proved to be too tempting a toy for Joey.